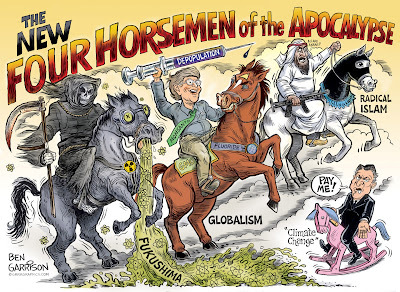 Here’s my reasoning behind my latest cartoon: Let’s start with the climate change hoax, er horse. I showed Al “Pay Me" Gore on a politically correct rocking horse because climate change is not the catastrophic event they claim it to be. Al Gore predicted the ice cap would be melted by 2015. Nope, still there. Climate change is about globalism and collectivism. It’s also about fear. They want to distract us from other more pressing issues such as losing our liberty. Besides, pay a scientist enough money and reward him with acclaim and peer approval and he will produce the required data to confirm any agenda. Sure, the climate changes, but they leave out one important factor in their data: The sun. They’d rather blame man for breathing and make him pay a carbon tax for the guilt of soiling the elite’s property: “Their” Earth. The most dangerous horse is Fukushima. And in fact, all nuclear energy is dangerous. It’s a hell of a way to boil water, and some geniuses built a shoddy nuke plant right on the sea and in an earthquake zone. Of course, nobody went to jail for it. Now there’s a huge meltdown and the core is ready to go into the aquifer. The Pacific will continue to be polluted with radioactivity and it’s all cumulative. We’re also a flood, EMP strike, or big earthquake away from this happening elsewhere at a nuclear power plant. Shut them down. Shut them all down. It’s fooling with something that could lead to an extinction-level event. Of course, the elite running the show will be safe in their underground bunkers if that happens. They love death—as long as it happens to us and not them. The middle horse features ‘them.’ Who is them? The show runners, of course. The globalist elite. The Bilderberg types. The CFR and illuminati. The Bill Gates megalomaniacs. They’re the ones who are into eugenics and force GMO foods, poisonous vaccinations, fluoride and chemtrails on people in order to dumb us down and send us to an early grave. Soros is using mass muslim immigration as a means to destroy western civilization. Why? Because he considers himself a god. He wants to see civilization destroyed, then rebuilt into something he likes and controls. These people are a big threat to humanity. They want humans culled. Arrest Soros and confiscate his wealth. As for the last horse, some might say Islam is in and of itself ‘radical.’ They might be correct. For a long time I believed the palaver that Islam is a ‘peaceful religion.’ Not so. It’s a religion of force that has spread through violence and intolerance. They believe in Sharia law, not things outside of their Quran—such as our Constitution. The most virulent form of Islam, Wahhabism, is funded and spread by Saudi Arabia, which is run by a violent and repressive royal regime. Religious police whip and assault those committing minor offenses such as playing music in the park. Dissidents are tortured and beheaded. The fact that they are an ally of the the US is disgraceful. Of course, it’s all about the oil. Islam taking over the world will lead to a new dark ages. It’s up to muslims themselves to reform and stop the death cult. There are a few heroic muslims who want to achieve this, but they are too few and far between. The pussyhat protestors should be out in the streets screaming about what’s happening to women in middle eastern countries. Many treat their women abysmally.